﻿ Myshall & Drumphea Parish, Co. Carlow, Ireland - Local Organisations - Myshall I.F.A./N.F.A. Myshall National Farmers Association was founded exactly 50 years ago in 1957 just two years after the foundation of the National Association. The first meeting on record was held in Myshall Hall on the 21st January 1958 with 21 members attending. In the fifty years since as agriculture has developed to become one of Ireland’s biggest exporting industries it has helped protect farming families and improve their livelihood from a subsistence level. Members of Myshall N.F.A. in the early 60’s actively participated in the campaign for recognition as a representative organisation for farmer's rights. Farmers went on a massive campaign of “Pay No Rates’ to correct some of the injustice of the infamous ‘Poor Law Valuation System’ (Rates on Agricultural Land). In 1966 our members were among the 30,000 who marched to Government Offices Dublin and remained outside for 20 days until finally the Government recognised the N.F.A. In December 1971 the N.F.A. became the I.F.A. and the success of the organisation has had profound effects in areas like Myshall and Drumphea with accession to the E.E.C. and through its ‘Social Charter’ many farms were classified as disadvantaged and received substantial subsidies on sheep and cattle. A lasting memory for our members was the cattle crisis of 1974 when the overload of cattle on the market was so bad that the Government and EEC in desperation responded with a calf slaughter scheme. The late seventies saw the abolishment of rates on agricultural land and farm buildings. At the same time many farmers were brought into the income tax net. At this time Myshall I.F.A. saw the need for Sheep dipping facilities in the area and after lobbying unsuccessfully to Carlow Co. Council for funds, the members took on the task themselves. Funds were collected from the local farming community and the sheep dipping tub that is still in use today was built. The 80’s was a time of change with production capped by an EU quota regime and many progressive farmers were forced to sell land by banks to clear debts as a result of interest rates as high as 21%. I.F.A. intervened with Banks and Government and got a certain amount of leeway. The 90’s saw farmers caught in a cost/price squeeze between falling or static prices and multinational supermarket chains. At this time Myshall I.F.A. participated in the national protest pickets that were held at Beef plants. Since the dawn of the new millennium the pace of change in agriculture has accelerated and now approx 60% of farmers work in off farm jobs. Cheap food is being imported on a massive scale. The loss of the sugar beet industry in the area shattered many local farmers when the EU took a political decision to rationalise EU sugar production. I.F.A. members from this general area who were beet growers organised themselves under the name Midland Beet Growers and mounted vigorous campaign on growers behalf. Myshall I.F.A. 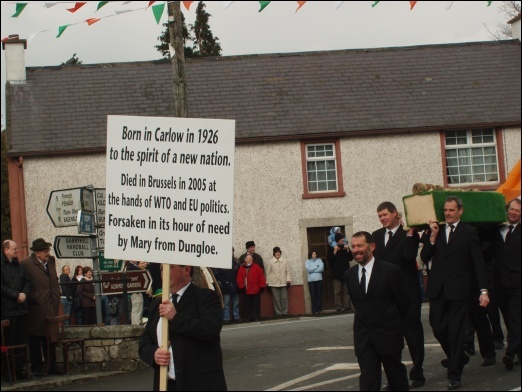 marked the passing of the Irish Sugar Industry with float in the 2006 St. Patrick’s Day Parade in Myshall.